As an expert in the manufacturing of advanced composites, TENMAT developed a unique blend of high-performance fibres to build an extremely tough and resilient material for the aluminium industry. FEROFORM F57 is the ideal choice for high impact applications, providing a long-lasting, maintenance-free wear surface. This innovative material replaces old-fashioned steel rollers, which are infamous for scratching the delicate surface of the aluminium. In modern aluminium hot rolling mills, the quality of rolled aluminium is critical for successful use in applications ranging from aerospace to pharmaceutical. The surface finish of the rolled aluminium is dependent on the rollers. FEROFORM F57 covered rollers provide a durable, high temperature resistant surface that protects the aluminium during the hot rolling process. FEROFORM F57 is successfully used by major aluminium manufacturers around the world, eliminating the need for grinding and regular cleaning of the production lines. 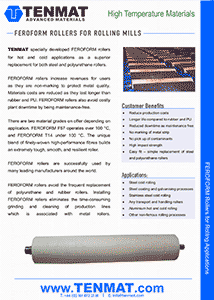 TENMAT FEROFORM F57 can be processed around your existing steel rollers. Alternatively, we supply stand alone full or split sleeves that simply slide onto your steel mandrel. Other applications for FEROFORM F57 in aluminium plants include sliding pads, bearings, and thrust washers. As an expert in the manufacturing of advanced composites, TENMAT developed a unique blend of high-performance fibres to build an extremely tough and resilient material for the aluminium industry. FEROFORM F57 is the ideal choice for high impact applications, providing a long-lasting, maintenance-free wear surface. This innovative material replaces old-fashioned steel rollers, which are infamous for scratching the delicate surface of the aluminium. In modern aluminium hot rolling mills, the quality of rolled aluminium is critical for successful use in applications ranging from aerospace to pharmaceutical. The surface finish of the rolled aluminium is dependent on the rollers. FEROFORM F57 covered rollers provide a durable, high temperature resistant surface that protects the aluminium during the hot rolling process. FEROFORM F57 is successfully used by major aluminium manufacturers around the world, eliminating the need for grinding and regular cleaning of the production lines. 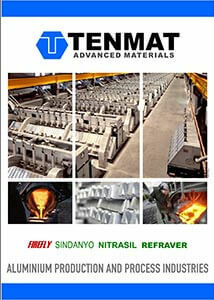 TENMAT FIREFLY 1125 cladding for steel rollers is made of a unique blend of high performance refractory fibres, designed to meet the extremely high temperature demands of the stainless steel industry. Red hot stainless steel requires special handling to avoid surface imperfections during the cold rolling process. 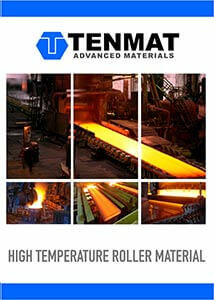 TENMAT in collaboration with major steel works around the world has engineered a solution to cover rollers, that is able to withstand the high temperatures of this arduous application and improving the overall quality of the steel. TENMAT rollers are dimensionally stable, tough, resilient, and provide long life, reducing the need for frequent and costly replacements. TENMAT FIREFLY 1125 is typically supplied in cut-to-size rings, ready to be installed onto existing rollers. Other forms of supply available on request. 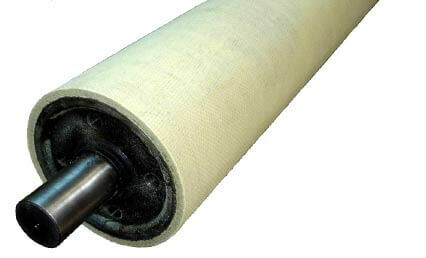 TENMAT FIREFLY 1125 cladding for steel rollers is made of a unique blend of high performance refractory fibres, designed to meet the extremely high temperature demands of the stainless steel industry. Red hot stainless steel requires special handling to avoid surface imperfections during the cold rolling process. 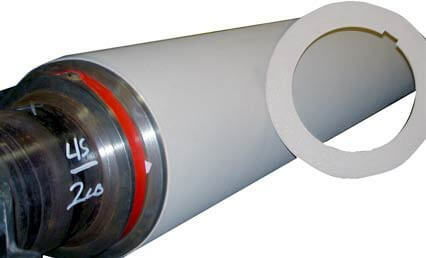 TENMAT in collaboration with major steel works around the world has engineered a solution to cover rollers, that is able to withstand the high temperatures of this arduous application and improving the overall quality of the steel. TENMAT rollers are dimensionally stable, tough, resilient, and provide long life, reducing the need for frequent and costly replacements. TENMAT FIREFLY 1125 is typically supplied in cut-to-size rings, ready to be installed onto existing rollers. Other forms of supply available on request.